The 375th Soundtrack of the Week is Florian Fricke's music for his own travelogue film Kailash: A Pilgrimage to the Throne of the Gods. This might not be too far away from whatever "new age" music is supposed to be. It's heavy on synthesizer and flutes, chant-like vocals and such. 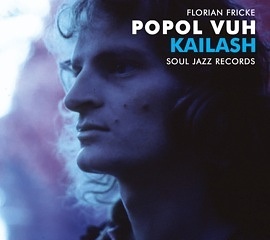 But Fricke was the leader of Popol Vuh and his music here has intelligence and conviction. So don't listen to it if you want to raise your heart rate, but in the right mood it could lower your blood pressure. It's actually quite nice if you're in the mood, a little bit like the Blade Runner soundtrack.